After the announcement in June, Alesis have now released their updated all-mesh-head electronic drum kit, perfect for beginners or those wanting a great e-kit on a budget. For the price, this is an excellent way to get into electronic drums without sacrificing on feel (or looks). The Alesis Nitro Mesh’s big drawcard are the all-mesh snare and tom heads – this is something usually only found on higher-end electronic drums (on cheaper kits you’ll sometimes just get a mesh snare drum). Alesis have stepped things up by providing an 8″ dual-zone mesh snare, and three 8″ mesh toms. The dual-zone snare means you can trigger two different sounds on the one pad (for example a regular snare hit and a rimshot or rim click). 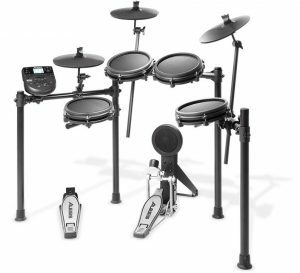 The Alesis Nitro Mesh kit also features three 10″ cymbals (hi hats, a chokable crash, and ride), a hi hat pedal, kick drum pedal, and kick drum tower. The brain driving the Nitro Mesh kit is the Nitro drum module, which comes with 385 drum, cymbal, and percussion sounds, plus 60 play-along songs, a sequencer, and a metronome. You can record your performances directly onto the module, which is helpful for analyzing your playing and finding areas to improve. There are 40 built-in drum kits, spanning a nice range of music genres and drumming styles, and drummers can program their own customized kits. The Nitro module allows drummers to assign any sound to any drum or cymbal, to build full custom drum kits. Importantly, the Nitro module also has USB/MIDI and MIDI in/out functionality, allowing drummers to plug into a computer (PC or Mac) to record and use virtual instruments. Connecting to drumming software (like EZDrummer) will give you an unlimited range of kits and sounds, and the ability to record anywhere with just a computer. MIDI in and out also allows connection to MIDI-enabled drum machines, other drum modules, or any other MIDI music gear. Other must-have features include the CD/MP3 input, allowing you to play along with your own music, stereo outputs (for connecting to a PA/drum amp), and headphone output for silent practice. Everything is supported by a 4-post aluminium rack, and you’ll get everything you need to start playing in the box (drum sticks, drum key, cables, guides). 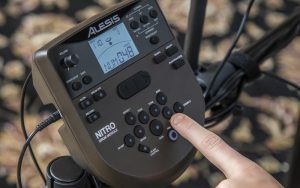 If you’re looking for a budget-friendly way to get into electronic drumming, the Alesis Nitro Mesh is an excellent choice. Mesh pads are quieter than standard rubber pads on other kits in this price range, and this kit both looks and sounds great. It’s perfect for apartment-drumming (and if you need to be extra-quiet, see these tips for reducing your drum volume). 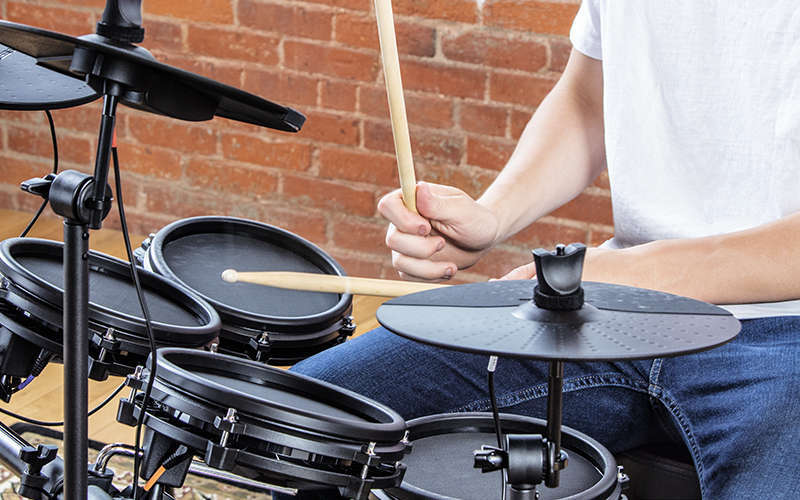 Yamaha have also recently announced an upgrade to their budget-friendly electronic drums with the DTX402 – it’s also worth checking out if you’re shopping for a quality electronic drum kit that won’t break the bank. It’s worth mentioning, however, that the Yamaha kit come with rubber and not mesh pads (although the rubber does feel nice and is fairly quiet). Click here to check the latest price of the Alesis Mesh Nitro kit (and to read more). 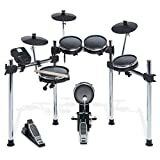 Shopping for a good electronic drum kit that won’t break the bank? Make sure you read our review of Roland’s TD-1DMK, with all mesh snare and toms! Previous PostPrevious Sabian’s Custom Cymbal Shop: Create Your Own Custom Cymbals!